Edstrom Van Racking is offered for a range of Renault panel vans. In order to operate in tough conditions while providing ease of use, Renault panel vans need van racking suited both to the van and most importantly, to you. The smallest model, Kangoo, is packed with a range of clever and practical features making life in both the cabin and loading area easier while saving you money. This includes an optional sliding roof flap which allows the vertical storage of oversized objects. With the mid-range Trafic model, you get a practical, comfortable and safe van fitted with the latest high tech driving and safety features which can carry 3 Euro pallets in the SWB version as standard. The largest Renault panel van, Master, is available in four different wheelbase lengths and three roof heights, which enables you to maximize the space to suit your needs. It boasts load volumes of up to 17m3 and payloads of up to 1,593kg (3.5T versions) and 2,167kg. More info on complete van racking systems for Renault vans is available in our custom Renault brochure. Feel free to get in touch with us or one of our dealers when you have any questions. We always recommend that you get your Renault van racking system installed by one of our dealers. This will ensure that the racking is properly installed. This also gives you a 5-year warranty on the racking and the installation. If you install the van racking yourself, we provide general installation instructions and then you have a 3-year warranty on the parts and accessories. If you need any advice, we and our professional installers are always available. Of course, you can buy our products in our online shop. You can study our van racking system in detail in our drawing program. It is a simple program to use backed by cutting edge technology. This gives you a better idea of what your Renault van racking will look like, and in 3D as well. Here at System Edström we have developed complete van racking systems designed for your Renault panel van. We offer van racking for the Renault Kangoo, Trafic and van racking for the Renault Master. Our van racking designs have been developed with functionality in mind, so they always meet your needs. 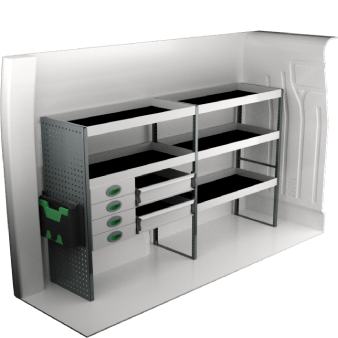 Maybe you just need shelving for storing your tools, or a more complex system including drawers, carry-all bags and other accessories for a Renault van racking system. Naturally our systems are crash tested. And if you also let our dealer install your system, you get a 5-year warranty into the bargain. 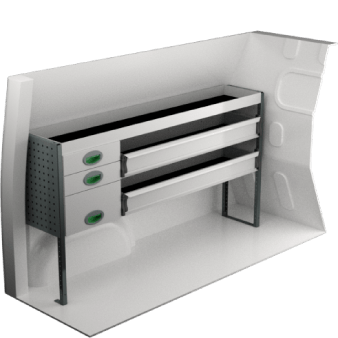 In addition to our complete van racking systems, you can custom design your Renault van racking. 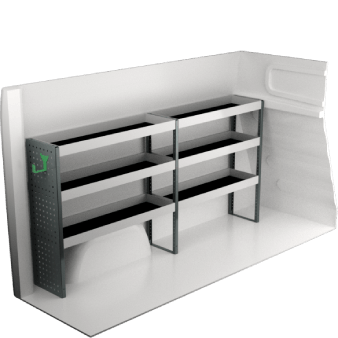 Our system is highly flexible and if you want to remove or add something, or simply get a personally customized van interior, then our Renault van racking system is the right choice for you. We always recommend that our customers reach out to the expert staff at our dealers to receive the best possible service. If you would rather do your own research before contacting a dealer, you can do so in our webshop. It offers views of the vehicle racking systems as they look in the vehicle and you can even customize the Renault Van Racking system to suit your needs.